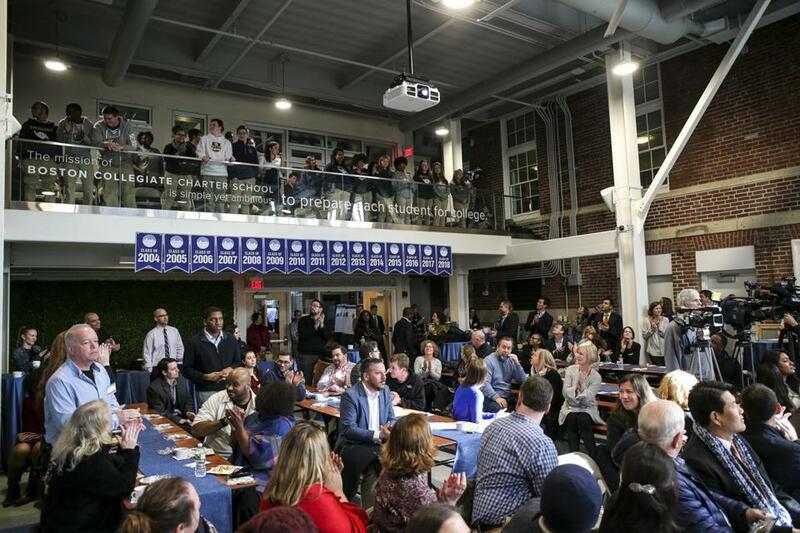 Attendees applauded Monday during a ceremony at Boston Collegiate Charter School’s expanded and renovated upper school campus. “It makes [the students] feel like this is a real school,” said Shannah Varón, executive director at the school. Previously, students had to eat lunch in classrooms, a practice that broke up the student body for what is a communal experience for many schools. The STEM-oriented school had only one science lab. Classrooms were in constant use, with different teachers cycling in and out each period. Enrollment at the school, which was founded in 1998, has grown from 120 students in grades five through seven to 700 students in grades five through 12. Boston Collegiate prides itself on college preparation, with 100 percent of students since the class of 2004 being accepted to college. More students increased the need for certain facilities, said Varón. “We have a lot of kids with home environments not conducive to doing homework, so now they can do that here,” Varón said. The expansion will allow for programs not previously possible, such as a film festival teachers have been dreaming of and community conversations led by the student government. For senior Kanilla Charles, the expansion means she had lunch in a cafeteria for the first time in her high school career. Charles, a Roxbury resident, has applied to five colleges, including New York University and Northeastern University. In her speech Monday before over 100 attendees that included politicians, school officials, and residents, Charles spoke about other inconveniences students had faced — walking to the Plumber’s Union building for assemblies in 7 degree weather and the draining effect of sitting under artificial light all day. With the expansion, students can file down the stairs into the cafeteria for assemblies. The new classrooms overlook Boston, and light streams in the windows lining the walls. Charles said she hopes the next generation of students take care of the space, before inviting her “bestie,” Mayor Martin J. Walsh, to the stage. Walsh said the presence of the school — on Mayhew Street — has enlivened the neighborhood, creating a space for education from what used to be empty buildings. About 30 students watched the proceedings from a glass balcony above, standing up toward the end of the program as the adults applauded them.